The City of San Rafael is simplifying the process for restaurant owners to build On-Street Dining projects fronting their place of business. These On-Street Dining projects would be located within existing parking stalls on the street, and when built, they inspire increased pedestrian activity and a vibrant street life within our Downtown, which is critical in creating a destination where residents and visitors want to patron, stay, and shop. The Community Development Department is the lead department overseeing On-Street Dining applications, so the process will start when the initial application and an Outdoor Dining License Agreement is filed with them. Community Development will coordinate with the Department of Public Works, referring a set of plans for their review. Both departments will perform a review of the proposed On-Street Dining project and provide feedback, focusing on design and constructability. Once major issues from the review are addressed and complete application is provided, the City will discuss the proposal with other department representatives and determine if any changes are needed for more technical compliance. Afterwards, Building Permits and a temporary encroachment permit will need to be applied for within our Building Division and Public Works Department, respectively. Once issued, construction may begin. Note that a Building Permit would be required to build the On-Street Dining project, and the cost to apply for the Building Permit is not waived. If you would like an estimate of the Building Permit fees, please have ready a total valuation for the project and contact the Building Division at (415) 485-3367. Please also contact the Building Division for any general questions related to applying for a Building Permit. 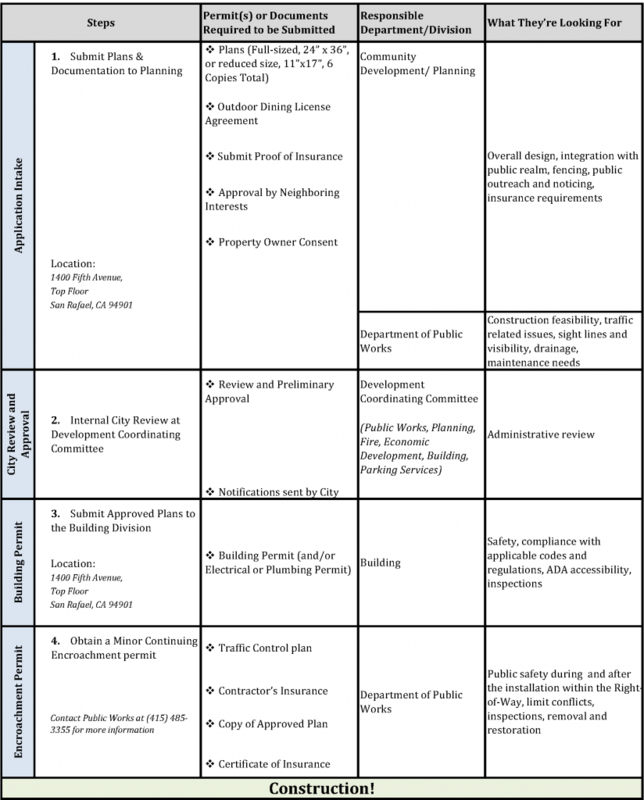 To maintain a streamlined process, the applicant must also seek input from the two immediately adjacent storefront businesses as well as the adjacent property owners for their feedback. Letters of support obtained by the applicant are highly encouraged from nearby business owners, residents, and other stakeholder groups. Note that this is in addition to the required City Notice below. While approval from each adjacent tenant business and/or property owner is not required to approve the On-Street Dining application, it is highly recommended for the City to process the application request more efficiently. It is strongly encouraged that applicants contact business owners and property owners early on to ensure their feedback is heard and considered before fully designing the On-Street Dining project. Notices by the City will be mailed to adjacent properties and tenants of the proposed On-Street Dining project to solicit neighborhood feedback. Please note that for the City Notice, adjacent businesses and property owners may include businesses and property owners across the street. The notice must also be posted on-site for 15 calendar days. All comments and feedback received during the noticing period will be considered before a decision is made by the Development Coordinating Committee whether to move the On-Street Dining application forward along in the process. Any appeals filed within 5 business days of the decision after the noticing period concludes would go the City Manager or their designee for a final decision. Contact the Planning Division at (415) 485-3085 for more information regarding noticing and appeals. To ensure proper removal and restoration of the Right-of-Way, the property owner or business owner shall be a signatory on the agreement and encroachment permit as guarantor for the removal and restoration. To limit the potential impact these On-Street Dining areas may have, no more than four (4) On-Street Dining projects spread throughout Downtown taking up no more than eight (8) cumulative parking stalls would be allowed, with no single On-Street Dining project occupying more than two (2) parking stalls. The maximum number of On-Street Dining projects allowed in the three identified sub-districts are also capped at two to evenly distribute these projects (see attached map for more information). The City will continue to observe the limits to the number of allowed On-Street Dining projects to decentralize the potential impacts to the Downtown area. 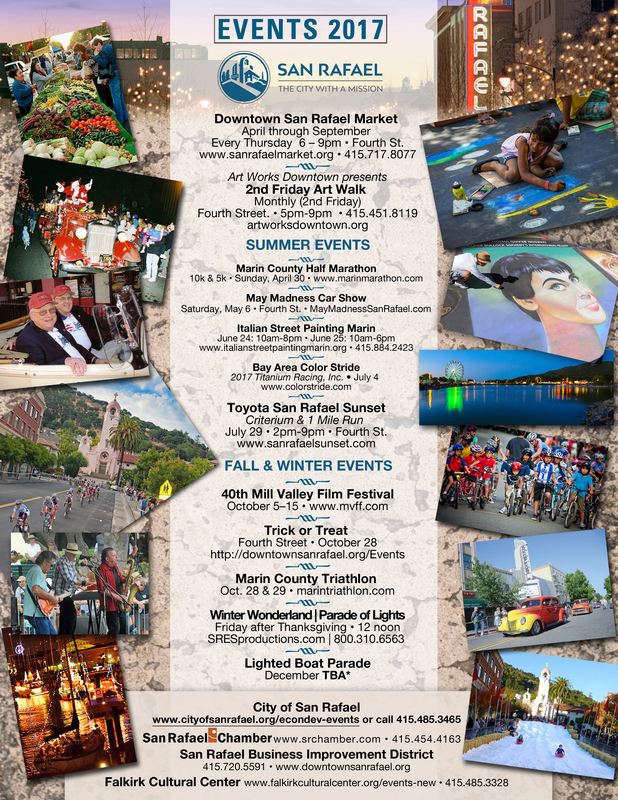 Please contact the Economic Development Department at (415) 485-3134 for more information on the concentration of On-Street Dining projects in Downtown.